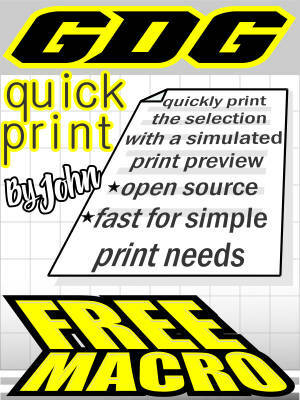 Free macro for quickly printing the selection via a simulated temporary print preview screen. Open source as so you can modify print settings for your needs. Create a shortcut on a toolbar to macro GDG.QuickPrint. Use provided icon if desired. Select an item. Run macro. Adjust size on simulated print preview area. Press Enter to print and Esc to cancel. Failure to press Enter or Esc will cause error. You need to modify code for your printer and printing needs. Recommended user experience level: Advanced.